From the anime series ‘Mashiroiro Symphony” comes a Nendoroid the playful young girl who is kind to everyone, Sana Inui! She comes complete with three expressions, and also comes with parts that let you display her as she looked on the packaging for the game – with her hands shaped as a heart. She also comes with folded arm parts to create a more upset looking pose. Last but not least, the strange cat-like creature, ‘Ponnya’ is also included – allowing you to recreate all sorts of scenes and poses from the game and anime! She is going to be released on May 2012 with a price tag of 3500 Yen. From the second season of the anime series set in a family restaurant, ‘WORKING! 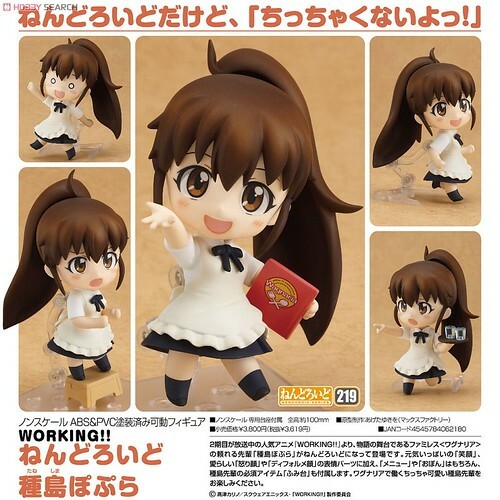 !’, comes a Nendoroid of the reliable waitress, Popura Taneshima! She comes with three expressions, including a smiling face, a cute looking upset face and a chibi face. She also comes with a menu for the restaurant, a tray to carry out orders to her customers and of course a little footstool to help her reach those high up places! The small and lovable Taneshima is ready to be displayed hard at work – or in whatever pose you think suits her best! 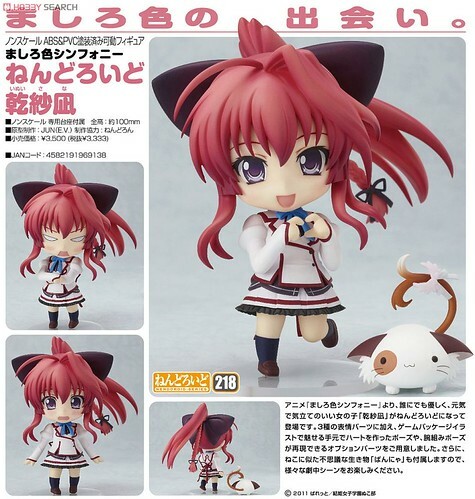 The adorable small Popura-chan is scheduled for April 2012 release with a price tag of 3800 Yen. From the anime series ‘WORKING! !” comes a playset designed for the Nendoroids of the series to be displayed in Wagnaria itself! 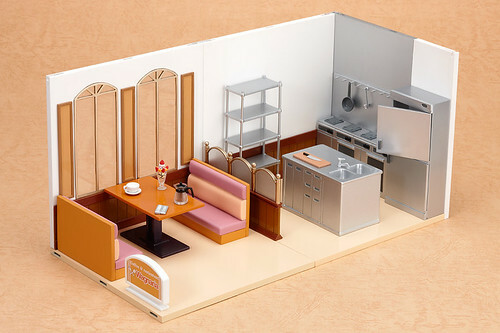 The A set features the guest seating area of the restaurant, while the B set recreates the kitchen. You can connect the two sets to recreate the full restaurant. Grab some of the Nendoroids from ‘WORKING! !” and recreate your favorite scenes from the series! A Set Contents: Two windowed walls, floor, table, 2x sofas, parfait, coffee cup & saucer, coffee pot, order machine and Wagnaria signboard. B Set Contents : Normal wall, kitchen wall, floor, refrigerator, stove, shelves, sink, cutting board, knife, frying pan, ladle and a floor divider screen. This entry was posted in News and tagged inui sana, mashiroiro symphony, max factory, nendoroid, phat company, playset, poplar, taneshima popura, wagnaria, working.